Archaeological excavation is underway at a site off Brunswick Road in Gloucester. The site originally formed part of the old Gloscat Campus and now that the demolition of the Media Studies Building has been completed, mitigation works on behalf of Linden Homes Western are being undertaken in advance of construction works. Work began in mid July and so far the dig has uncovered some fascinating insights into life and death in Roman Gloucester. 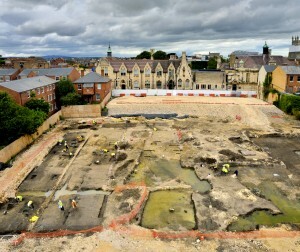 The site is situated to the east of Brunswick Road in Gloucester, an area which falls just outside the ramparts of the original Roman town Glevum. 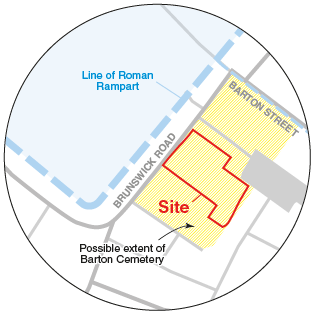 Previous work on the site, undertaken in the 1960s prior to construction of the recently demolished Media Studies Building, uncovered part of an impressive Roman cemetery which is thought to extend from St Michael’s Square to Barton Street. Until recently it was thought that this 1960s development had destroyed the archaeological remains but excitingly, this is proving not to be the case. 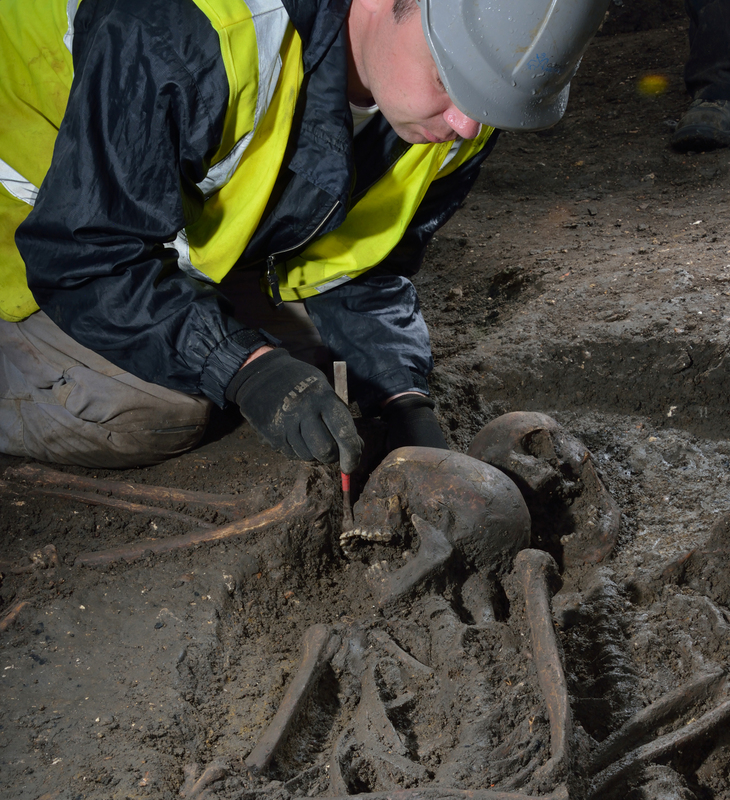 To date, our archaeological team has uncovered more than 100 Roman burials. The Cemetery was positioned just outside the south-eastern boundary of the Roman town. Interestingly the burials were aligned parallel and perpendicular to the nearby Roman ramparts and the majority were placed in relatively shallow graves, which was probably due to the high water table in this area. For similar reasons, archaeologist believe this is why the cemetery is mainly concentrated in an area close to Brunswick road where the ground is slightly higher and therefore drier. The burials themselves paint an intriguing picture. All the burials discovered so far appear to be from the Late Roman period and a variety of burial practices seem to have been observed. Both supine (laid flat) and prone (face down) burials have been identified. Only 9 of the burials were placed within coffins and very few grave goods have been found. The presence of hobnails suggest that footwear was worn or placed near the feet during burial. Three of the burials may well have been decapitated with their heads carefully placed at their feet. All the recovered artefacts and the evidence of how these people were treated both in life and in death will be carefully analysed by our specialist post-excavation team. It is hoped this new examination of the Barton Cemetery will shed fresh light on Roman burial practices in Britain. 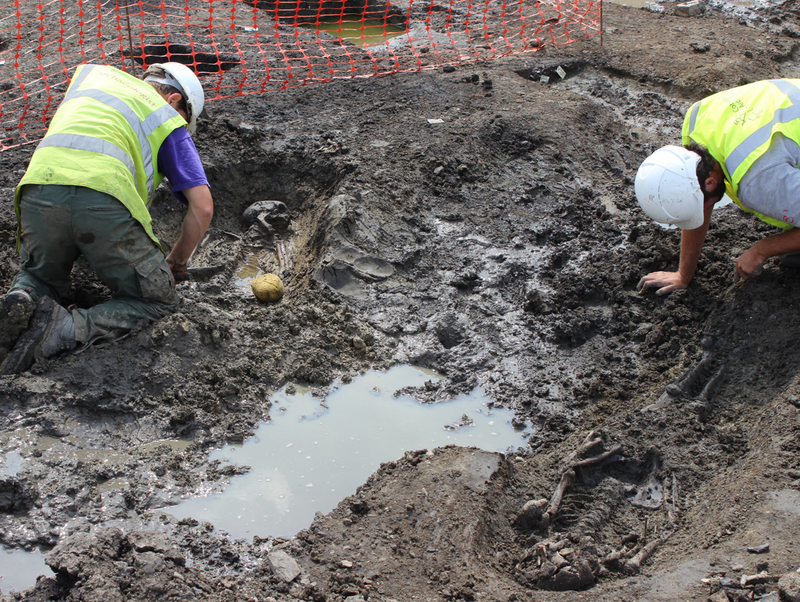 Following completion of the current phase of excavation there will be further archaeological watching briefs and excavations both here at the Media Studies Site and at the Greyfriars Site on the opposite side of Brunswick Road. It is likely that archaeological fieldwork will continue for several years as the construction programme proceeds. Keep up to date with developments as they happen here and on Facebook and Twitter.